*An adjusted, more academically written version of this blog has been published in the feminist anthropological journal Lova, issue #36. 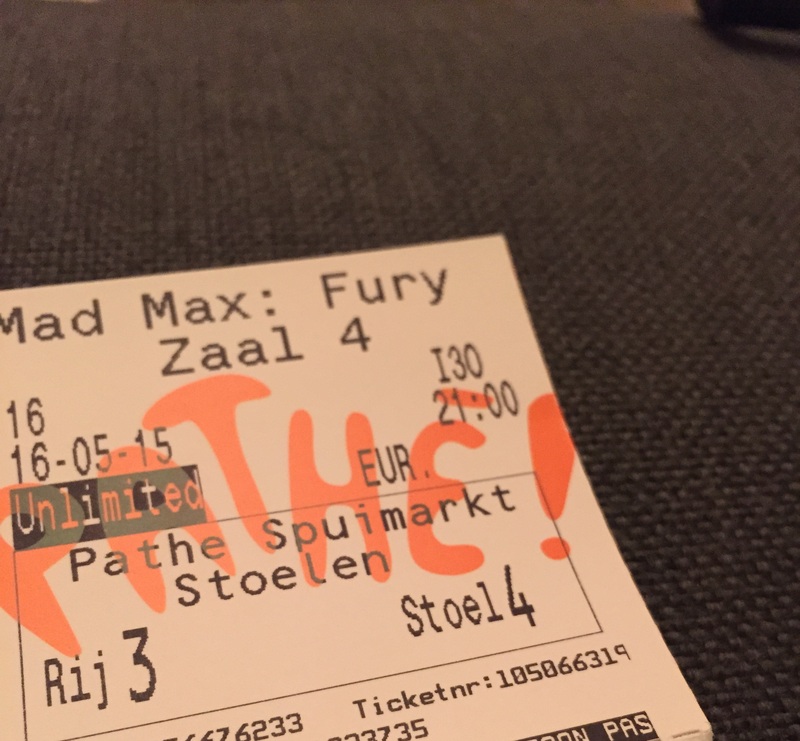 Last Saturday I went to Mad Max: Fury Road. I was the only one running out of the theatre in admiration of what we had just witnessed on the IMAX screen. My sister and cousins, with whom I watched the movie, stated that they found the narrative of the movie too fast, without a breather, and did not quite understand the story they just had seen. I also heard other people complaining about how this is not a typical action movie, because of the major role women play in it. In this article I will elaborate on why I believe this movie is powerful and important for the imaging and visual representation of particularly women in media. Charlize Theron portrays Imperator Furiosa who is trying to free the women who are enslaved as breeders away from Immortan Joe. He is a war lord with a breathing mask and has acquired power over people, because he is in charge of the water supply. He also has an army of War Boys and keeps other women as some sort of milk suppliers by tapping their breastmilk for making his warriors stronger. This indicates that breastmilk is more valuable than oil and water in the movie. Immortan Joe has full access to the water, but seems to perceive breastmilk to be more valuable for his army. It appears as if he believes the power of his soldiers derives from the contents of the breastmilk and that it has healing substances. The women are presented as machines, as producers, of something holy that is used to maintain the patriarchal hierarchy. However, the movie also shows in an imaginative way that the ability of women to breastfeed should be seen as a valuable strength and maybe even a form of labour. Moreover, breastfeeding and breastmilk should not be perceived as something unsanitary. The social media app Instagram allowed this year to the sharing of these photographs, before they were deleted because they did not comply to their policy (Instagram). And Elle Australia used a photo of model Nicole Trunfio breastfeeding her son for her subscribers on its June cover (Elle 2015). I personally think that this discussion can also be connected to the disabling effects visual images of breastfeeding women have on the sexual objectification of women in everyday life. With the visual image of women showing that their breasts are not only sexual, but also nurturing, the images are causing the sexual fantasies about women’s breasts to shatter. In the movie women play strong characters. Furiosa is a strong, almost bald, one and a half armed woman who has a lot of rage in her and drives a huge truck. These are qualities and actions that are generally not associated with women. The fact that she has a handicap, half of her arm is gone and she uses a metal prosthesis, is not mentioned once. Moreover, it does not affect her capability to drive a truck or to be independent. This not only shows that women who are missing some part of their body are less of a woman, but also that people with physical challenges are just as capable of anything as anyone who has all of his or her body parts. I, personally, found the fact that she is being represented as a ‘whole woman’ even more empowering when you think about breast and/ or ovary cancer survivors. These women are often seen as ‘less’ than a woman and lacking femininity, because they had to have a mastectomy or a hysterectomy (New York Times 2013). Furiosa’s handicap also does not make her a sad and helpless woman who needs to be saved by a man. Instead, she comes to work together with Mad Max, who is portrayed by Tom Hardy, on an equal level. The character of Furiosa lets the viewer see that women have rage in them and are just as interesting and strong and complex as man. Although the five enslaved women are wearing very tiny white fabrics, they are not per se (sexually) objectified by the director George Miller. They are, however, objectified and used by Immortan Joe. They are being used for their beauty and body by Immortan Joe, so they use this knowledge to protect themselves, Furiosa and Mad Max. They are also not just sitting there and ‘being pretty’ and ‘saved’ from harm. They can reload guns, get the truck out of the mud and are fearless. Nux, a War Boy who desperately wants to go to Walhalla is in the beginning of the movie set on capturing Furiosa and Immortan Joe’s ‘brides’ to bring them back to The Citadel and accomplish his wish. However, during the narrative of the movie he becomes a character who is capable of putting his own needs aside and shows his affection, or appreciation, by kissing Capable (Riley Keough) on her cheek. This shows that it should be okay for men, who are considered tough and powerful, to feel and show emotions. Also, Mad Max does not seem to have a need to prove his ‘manhood’ or ‘masculinity’, he does what he does because he thinks it is the right thing to do as a human being. He also lets Furiosa use his shoulder as a stabilizer for her to take a long shot with heavy armoury. More importantly, he is totally okay with her taking this weapon after he cannot make the shot. The portrayal of both Mad Max and Nux especially have gotten some very rude reviews by misogynists and Men’s Rights Activists (see for example Wired 2015, CNN 2015 and The Mary Sue 2015). Mainly, because the movie shows that men can have different interpretations of what ‘masculinity’ is or should be, which is taken as an offence by the misogynist men. The traditional ideas of masculinity are being thrown overboard in this movie by portraying men who are allowed and confident to show and act on their caring feelings. What is also praiseworthy is that there is not a sign of a love interest between the two main characters. Also, Furiosa is trying to get back to her place of birth where she was kidnapped with her mom who soon after their arrival in The Citadel died. After a long and rough journey Furiosa, Max, the brides and Nux arrive in the matriarch Green Land. Here they find the last of the women clan who survived. The women, who were of all ages were still fearless and very capable of handling themselves in the war against Immortan Joe. This shows that women, no matter what age they are, are still important and not less ‘useful’ in contemporary society. The older women were not being made fun of, instead they were presented as strong and powerful women and played an important part in the story. This is especially interesting when considering the recent developments and discussions of the age of women in Hollywood. Maggie Gyllenhaal revealed that she at the age of 37 was considered to be too old to be casted as the love-interest of a 55 years old man. Other actresses such as Meryl Streep, Helen Mirren and Patricia Arquette also publicly addressed the ageism and sexism issues in Hollywood which has gotten a lot of media attention (TheWrap.com). However, there also has been criticism, because others felt they lacked to include racism. Actress Kerry Washington called out issues relating to otherness, intersectionality and inclusive storytelling in Hollywood and society during the 2015 GLAAD Awards (GLAAD 2015). All women in this film show the audience that women are people and not a body that is to be owned or used for the pleasure and at the disposal of men. Moreover, the film tells stories of women who have lived with sexual and physical abuse and how they are capable of empowering themselves and others after such traumatic experiences. This is, in my opinion, a great step forward for the empowerment of female representation in media and deconstructing traditional gender roles within entertainment.